"Mr Alderman and Sheriff Hand is forty-six years of age, and is a native of Bottesford, Leicestershire. For many years he was associated with the well-known firm of Meeking and Co., and then commenced business on his own account as a woollen merchant and manufacturer in Lawrence Lane, Cheapside. Fortune attended his venture, says the City Press, and it is worthy of note that Mr Hand has instituted the bonus system, whereby everybody in his service participates in the profits of the firm." 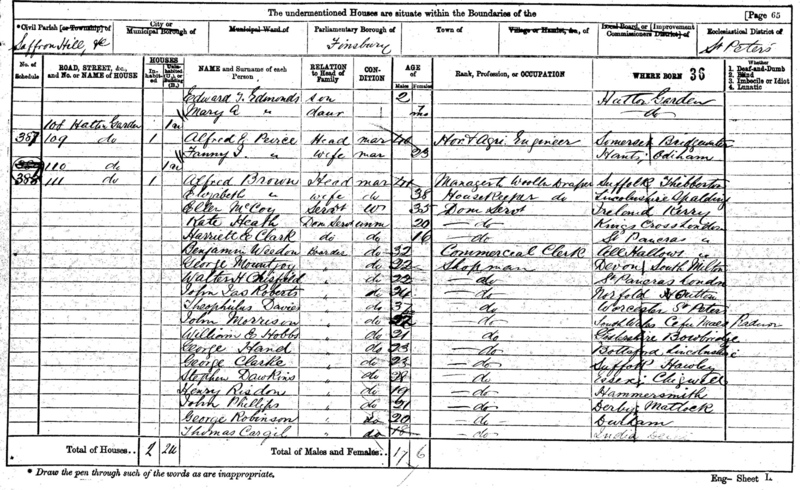 George Hand, recorded at 111 Hatton Gardon in the 1871 Census. 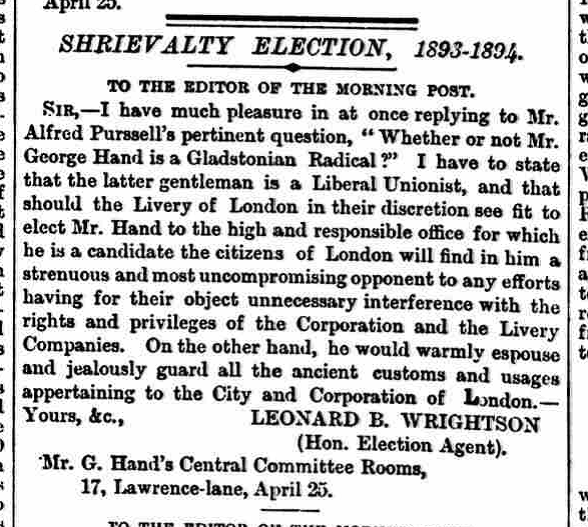 A letter published in the Morning Post in 1893, in which George Hand's electoral agent, Leonard Wrightson, defends his client following a hostile letter regarding Hand's political position from Mr Alfred Purssell. 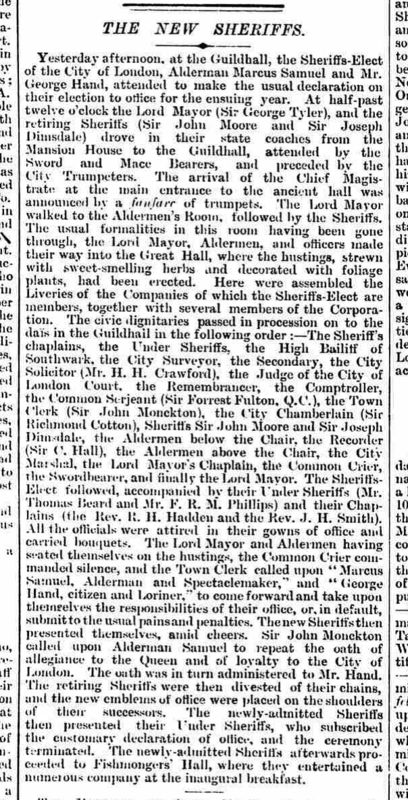 An account of the Election of the Sheriffs of the City of London during 1894. 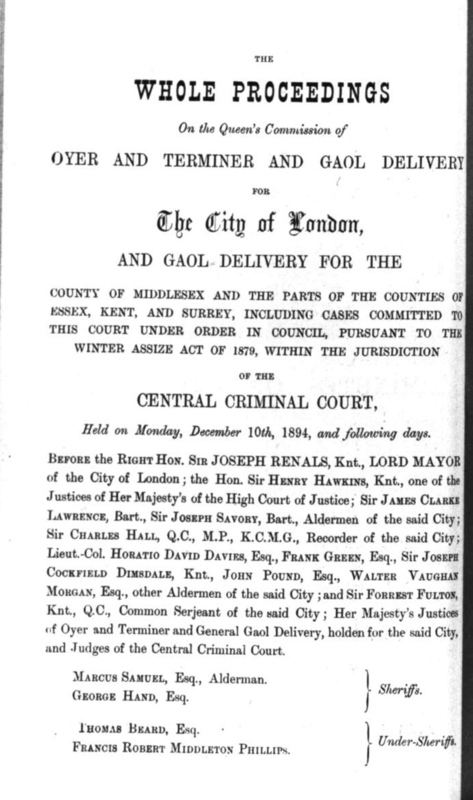 An example of one of the Notices that were published to announce a forthcoming case to be heard a the Old Bailey during George Hand's year as one of the Sheriffs of the Court. 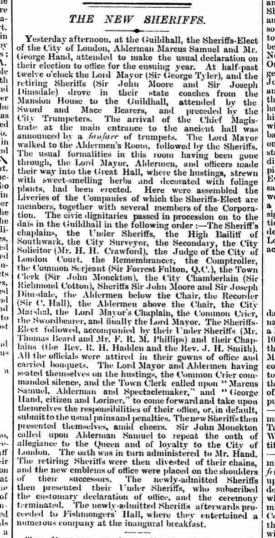 George Hand standing for nomination as Alderman for the Ward of Cheap, in the City of London. In the event, he lost the count and was therefore not elected. 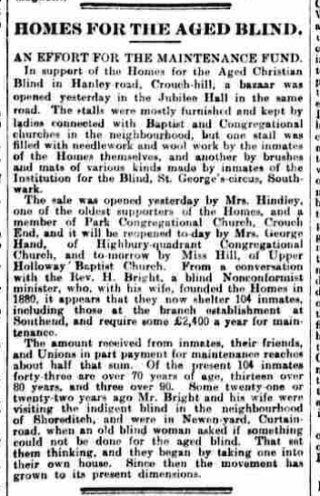 A press report from 1901 in which Mrs George Hand took a prominent part in a charitable meeting in North London. 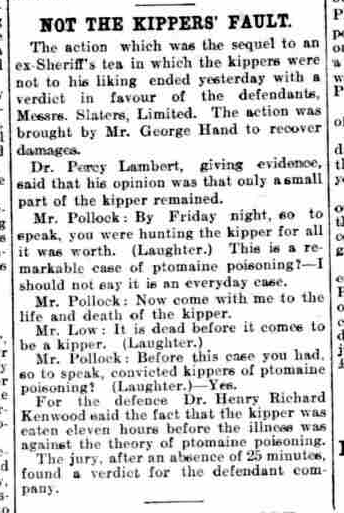 An account from 1907 of a court action in which George Hand sued a restaurant which had allegedly served him a poisonous kipper which made him ill. Evidence for the defence was given by a Mr Pollock. The jury found in favour of the defence and so Hand's prosecution failed. Hands Walk is the cut-through that provides pedestrian access from Granby Drive and the Warwick Flats to Bottesford High Street, and many will be familiar with the inscribed stone panel built into the wall at the entrance to the walk that is a monument to the cottages that formerly stood on the site and were provided by Hand’s Charity. The six cottages, known as Butcher Row, were used to provide income to support the village school (which was in the school house now known as the Old School). The cottages and the charity have been described by John Dockerel and Mike Saunders. This page follows on from John and Mike’s investigation, by putting together some background about the life of the charity’s founder, George Hand. In 1851, William (an agricultural labourer, born in 1821, from Barkston (Leicestershire) and Caroline (born in 1821 at Wellow, Nottinghamshire) lived at Bunkers Hill with William’s father, Thomas Hand (also an agricultural labourer, aged 57, from Barkston, Leicestershire) and infant George (aged 3). By the Census of 1861, the family were in a cottage at Duke’s Wharf, Bottesford (a wharf on the Grantham Canal). There were now four children: George (13, at school), Hannah (8), Caroline (3) and William (1). William senior indicated that his job was that of a shepherd. 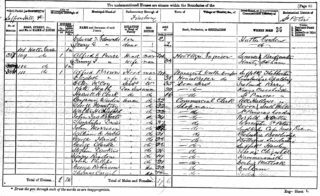 However, by the date of the Census of 1871, George Hand had left home and was living at 111 Hatton Garden in Holborn, London (civil parish of Saffron Hill). He was 23 years old, described as a ‘shopman’, one of 13 such workers, aged 18 to 37, who were staying at this address. He married in 1872: his bride was Maria Payne, who came from Bedford. In 1881 they were living at 11 Compton Road, Islington. The census record informs us that George Hand, aged 34 (born in 1847), was an ‘outfitter’, born in Leicestershire. With him were his wife, Maria, aged 37, who came from Bedford, and four children: Alice M (7), Percy G (6), Ethel (4) and Florence A (2), all born in Islington. 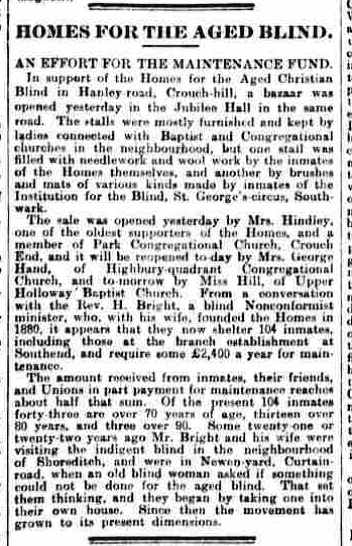 They were still at Compton R., Islington, in 1891, where George, now 44, was a ‘Ladies Tailor, Merchant’. Maria his wife was there, but none of the children. In 1901 George, Maria and daughter Ethel were at 250 Green Lanes, Stoke Newington. George described himself as a ‘wholesale ladies tailor, woollen merchant and JP for London’. Ethel was single, 24 years old. They were at the same address in 1911, where George, now 64, was a ‘blouse manufacturer’, Maria was 67, and they were accompanied by their son Percy George, 35, a mechanical engineer. Percy went on to serve in the East Surrey Regiment during the First World War. The inscription at Hands Walk carries the date 1891, implying that this was when the charity was established. In this year, as we have seen, was when George Hand and his wife Maria were living in Islington, London, and successfully running a fashionable lady’s clothes shop. They evidently had cash to spare and were keen to see some of it used to the betterment of George old home village. The years that followed were probably the best of George’s life. Their children Percy and Ethel were making their way in the world, and the other children had also left home (though their circumstances have not been unearthed as yet), and they were mixing in society. For a son of an agricultural worker in the Vale of Belvoir, this was a considerable success, showing that with hard work and ambition you can rise from humble beginnings. In 1893, George announced that he intended to stand for election to the position of Sheriff of the City of London, based at the Central Criminal Court at the Old Bailey. This was a very old position involving a great deal of ceremony and tradition. Two Sheriffs are elected annually for the by the Liverymen of the City Livery Companies (Wilipedia). The custom goes back to 1066, if not earlier. The Sheriffs have attended the Justices at the Central Criminal Court, Old Bailey, since its original role as the Court for the City. 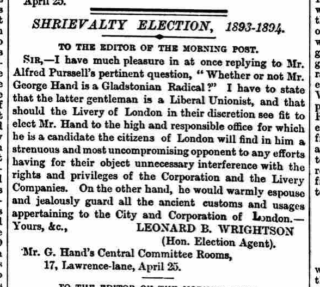 The Morning Post, on the 19th April, 1893, carried the announcement that “Mr George Hand, of Lawrence Lane, Citizen and Loriner, was yesterday nominated by the Lord Mayor as one of the Sheriffs of the City of London for the ensuing year.” His nomination did not pass without comment, as indicated by a letter written in his defence and published in the press by his Agent, Mr Wrightson. 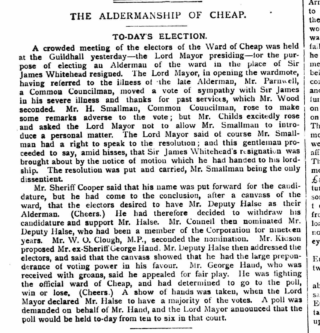 All went well, the election duly took place, and George Hand became was one of two Sheriffs elected for the year starting at Michaelmas, 1894, alongside Alderman Marcus Samuel. 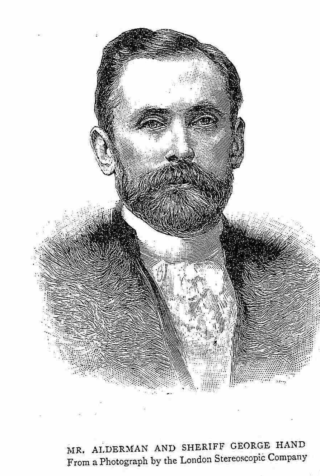 His term expired in September 1895. The description of George Hand as a ‘loriner’ is curious. The word means: “A maker of small iron objects, especially bits, spurs, stirrups, and mountings for horse’s bridles.” (OED), but there is no other evidence that he was involved in such work, a trade which had died out in the City of London by the late 1900s. 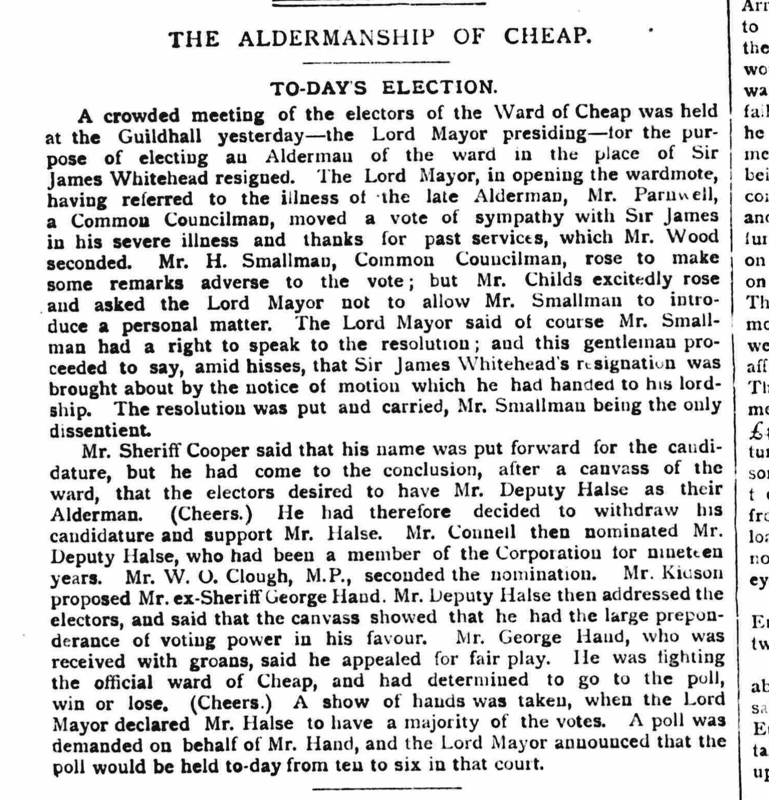 In 1896 stood for election as Alderman for the Ward of Cheap, but was defeated 466 to 178 votes by Mr R C Halse. After this, there are few accounts of George Hand in the press, as if he had decided to withdraw from public life and concentrate on his business and his family, though he was also serving as a JP in 1901 and possibly for some time after that. He died in 1928 in the St Pancras area, aged 81.